A closeup of Robert’s Chimerical Map, now showing at the Gallery! At its best, art is compelling. It makes you want to look at it; need to look at it. It provokes thought and starts conversations. Occasionally, those conversations take on an energy of their own, and that's when things really start to spread. Take, for example, Robert B. Park and his hit (dare I say viral) installation piece The Blue Loop; a found art installation and walking trail in his back yard. Mr Park was recently taken to court by Bath Township officials in the name of beautification and code enforcement. Months of debate ensued, and an entire community began talking about what is art and what is trash, what is beautiful and what is unsightly. And while this might seem like an academic debate, it culminated in a very real legal decision. Judge Michael Clarizio ruled that everything in The Blue Loop must come down within 45 days. Except for a single Blue Plastic Duck...the duck can stay. In the wake of the court case, an influx of people began visiting The Blue Loop. There was a standing-room-only turn out at the Township Board Meeting during which not a single person of the many who spoke was in favor of taking it down. And, lest we get too deep into the politics of the situation, you should know that the inspiring part about this piece is its tone. Warm and intelligent, it speaks to you without yelling. It is thought provoking without being preachy, and challenging without being offensive. How does that even happen in 2018? It comes from deep inside the heart of an unassuming 72 year old artist who found his calling years ago. That's how. There is only one reason he is doing this, and it shines. Robert Park has the community talking. Local artists, art lovers, property rights activists, free speech advocates, and government officials are all talking with each other about protecting art. One resident said "Found Object Art usually leaves me cold, I find it can be a bit contrived. But, I went and walked the loop and was truly moved." Another stood at the podium and said "I took my grandchildren....and you would have thought we were walking into Disney Land." Blue Ducks (as well as "Save the Blue Loop" yard signs) are popping up everywhere as the community voices their support for Robert. Some people are even making blue ducks from plywood, or creating their own found object art installations! It's so exciting to see the people of Bath engaging with art, whether talking about it or making it themselves. As my pastel of a giant pink frog is currently hopping around billboards in the greater Lansing area, you can probably imagine my amusement when it was announced that the one piece that is allowed to stay is a Blue Duck. In Judge Clarizio’s defense, he seemed quite reticent to rule against Mr. Park. But that doesn't lessen the absurdity of identifying this one piece among thousands as acceptable. The judge’s ruling created an instant rallying point for Robert’s supporters—an outcome predictable enough for one to wonder if Judge Clarizio intended it. Either way, Blue Ducks are currently quite a hot item, and Robert is appealing the decision and could use some help. Now Available at the Gallery. So, yeah...we jumped in on this one with two webbed feat. We ordered 200 Blue Rubber Duckies, which as of this posting are available for a donation of any size (leave a buck, get a duck). To be clear, the ducks are on us. Every penny of your donation will go to support Robert and his fight to continue being the amazing artist he is. Robert is a decades long resident of Bath Township. He has studied art at North Western Michigan College, and Michigan State University. His artwork—while not always blue—is always thought provoking and heavily detailed. This comes from his strong preference for mixed media, and plethora of sources he pulls from. In an interview during his Recent Exhibit in East Lansing, Robert called his process “an alchemy,” and that’s no exaggeration. Robert is able to pack so many types of information and materials into his work because he really has perfected the alchemic art of turning plastics, paints, disparate quotes or bits of maps—and yes, even lead—into gold. We are excited to be hosting Robert Park, and to do our part in helping him save The Blue Loop. Sunburns, Pastels, and Goose Poop Make a Glorious Day! Lexi put together this video about our visit to Kathryn’s studio. Check it out! We recently celebrated Eggleston Gallery’s second anniversary, and we’ve been reflecting on all the blessings we have received since opening. We want to share with you just one of those blessings: our friend Kathryn Sutton. We had the great luck to attend the World Conservation Network in San Francisco last October, where we heard Jane Goodall and many others. We would like to tell you about a decision we've made, and about the conference that inspired us. 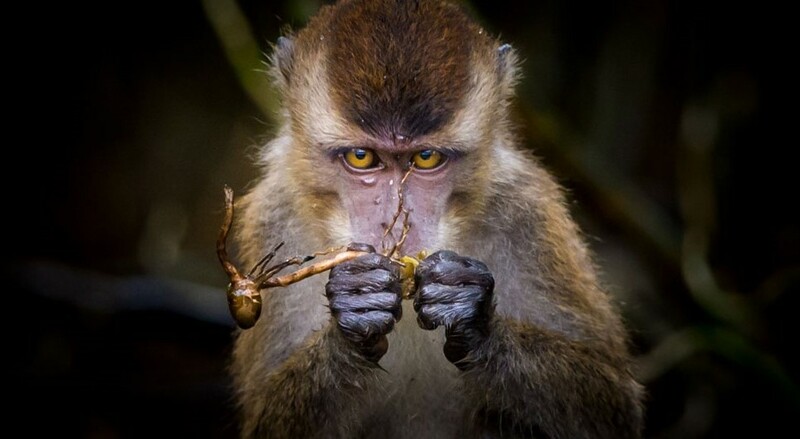 A long-tailed macaque--native to the Sabah jungle of Malaysia--examines a piece of fruit. He's quite the connoisuer! Eric Johnson is an extraordinarily talented photographer who has spent his retirement to--among other things--travel around the world, taking pictures of the animals he observes and doing his best to draw attention to their plight. He's been from the Rocky Mountains to Rwanda, and we want to share his Visions of Wildlife with our gallery. Karen Bartlett is a long time friend of Eggleston Gallery, and an amazing artist. We wanted to share a bit about her with you, so that you can appreciate her and her work. Her love of nature is absolutely contagious! Nick has made great contributions to art and conservation in the state of Michigan. We want to tell you a bit about his life and work, and how we came to know him, since we talk about him frequently. Grace Eggleston spent the summer in Washington DC interning with the World Wildlife fund, and our gallery assistant Lexi Flint spent the summer in New York interning at a fashion design house! I asked them both to share their amazing summer adventures.